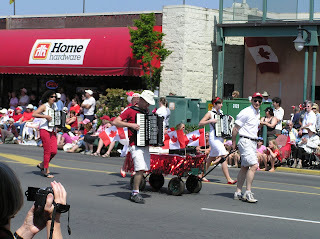 MISS NATASHA ENQUIST: ELECTRO-ACCORDION CHANTEUSE: Happy Canada Day! Canada is now 141 years old, and what better way to celebrate but by matching your outfit with 4 other accordionists, "eh?" 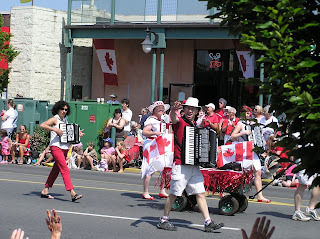 This was my second time marching in a parade with the Victoria Accordion Club Band. We marched with the North Saanich Council, who were wanting to promote a "green" float and parade. Not having a float made them wonder what kind of music they could have with them to make their "float" more interesting. A big reason I love the accordion is because its so portable and self-amplifying. The North Saanich council asked us to join them and it had a great response at the parade. The North Saanich Mayor and Councellours flailed around us with flags and pulled a small wagon with a generated soundsystem, which we play along to for a louder effect. The band members are very sweet people, a great supportive group, with a lot of talent.